UNITED NATIONS, July 15 -- Despite former UN humanitarian coordinator Jan Egeland and others calling for the UN to remain involved in trying to mediate between Uganda and the Lord's Resistance Army rebels, on Wednesday the UN's envoy to the LRA affected areas Joaquim Chissano gave a final briefing under the mandate to the Security Council, and "stepped down" from his post. After the closed down Council session, Inner City Press and BBC Afrique asked Mr. Chissano to explain his reasoning. I am voiceless, Chissano said, pointing at his throat. 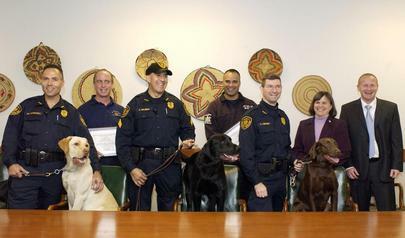 A UN official with him, Africa I Deputy Director Margaret Vogt, told the Press "we can deal with that later." When the Council's President for July, Uganda's Ambassador Ruhakana Ruganda, came to read out an oral press statement by the Council, he was asked how Chissano briefed the Council if his voice was so weak. He was clear, Ruganda replied. Inner City Press asked Ruganda to respond to what another Council Ambassador told the Press earlier, that ending Chissano's mission sent the message that the military solution to the LRA is viewed as the only solution. Video here, from Minute 1:40. No, Ruganda said, the military action of DRC and Uganda takes place alongside efforts to make Kony sign a peace agreement, "to remind" him of the need to sign. Inner City Press asked if it is true that Kony demands that the ICC and its chief prosecutor Moreno Ocampo come and explain what will happen on the ICC's warrant against him, before he considers signing. Ruganda said that Kony would gave accountability mechanisms in Uganda. Inner City Press asked, Not the Hague? Ruganda repeated, in Uganda. 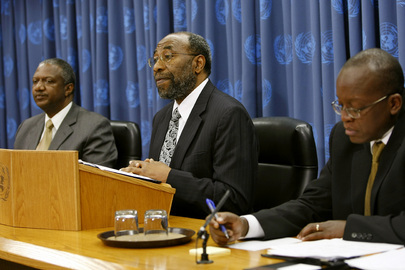 At Wednesday's UN noon briefing, Inner City Press asked UN spokesperson Michele Montas if Chissano's UN office in Kampala will close. Yes, Ms. Montas said, adding that Chissano had felt ill and couldn't speak at the stakeout. 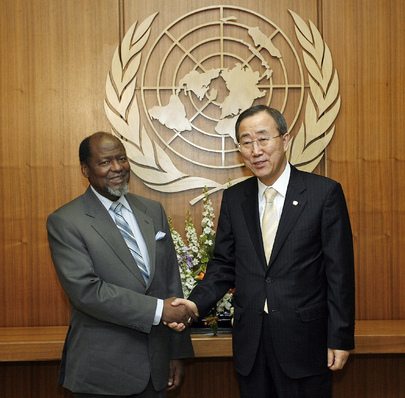 What about Egeland's critique -- does Chissano still have a role? Video here, from Minute 14:12. Not at this point, Mr. Montas said. 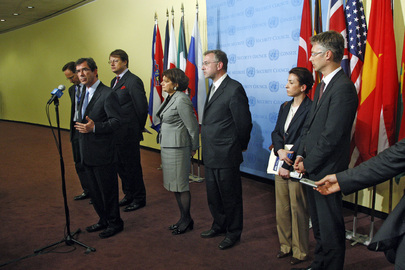 Who in the UN if anyone is reaching out to Kony, Inner City Press asked. Why end the effort at this time? Ms. Montas said the UN "stopped what had become useless." If so, it would be a first. Footnote: one would have liked to ask Chissano about any relation between his stepping down on the LRA and accepting another mediation job, for SADC, regarding Madagascar, trying to convince persuade what on Honduras is called "coup leader" Rajoelina and his Prime Minister Albert Zafy to meet with deposed President Ravalomanana and with his predecessor, Didier Ratsiraka. It is worth comparing the UN's stance on Madagascar's coup with that it has adopted on Honduras. Watch this site.